Since I do get a lot of skincare products to try out, my skincare routine takes a bit more time to complete compared to your average person. I know my hubby isn’t that pleased about it since he likes spending time with me and I’m in the bathroom for 20 or so minutes going through my routine steps. It’s hard to get him going on his own skincare routine since I’ve only really been able to get him to regularly use face cleansers and that’s it. 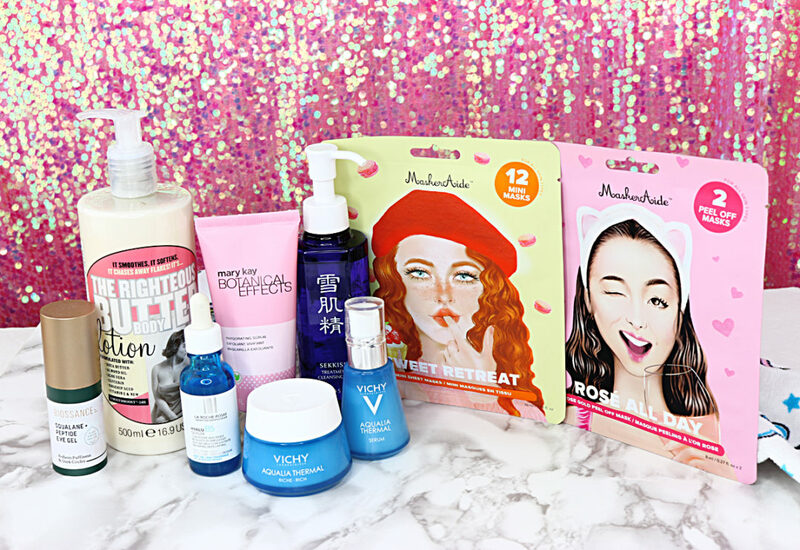 I recently got a box full of Vichy Normaderm products that I knew wouldn’t work for my dry skin but would work really well on his oily/acne prone skin. This was my opportunity to get him started on something that was more than just a simple cleanser but didn’t add many additional steps to make it a hassle for him. It was a success ladies! Here’s my husband’s new and approved skincare routine. Vichy’s Normaderm line keeps pimples, blackheads and shine under control that covers everything from cleansers to makeup. 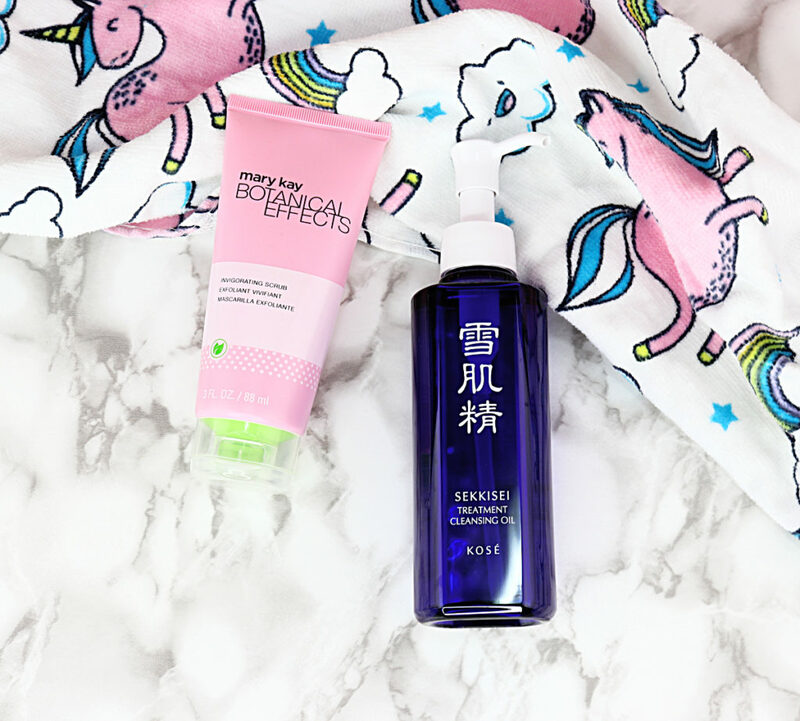 My hubby received four products to try out which included the Deep Cleansing Purifying Gel, the Cleansing Mattifying Foam, the Skin Balance Anti-Oiliness Aquagel and the Corrective Anti-Acne Treatment. The Deep Cleansing Purifying Gel ($19.95 / 200 ml / Available at Mass Drugstores) is formulated with LHA, salicylic and glycolic acid for skin that’s prone to breakouts, dilated pores and excessive shine. It’s a gentle soap-free and alcohol-free cleansing gel that deep cleans sebum and impurities without drying or irritating the skin. The ingredients in it have purifying, anti-bacterial and keratolytic properties to help prevent new breakouts from happening. 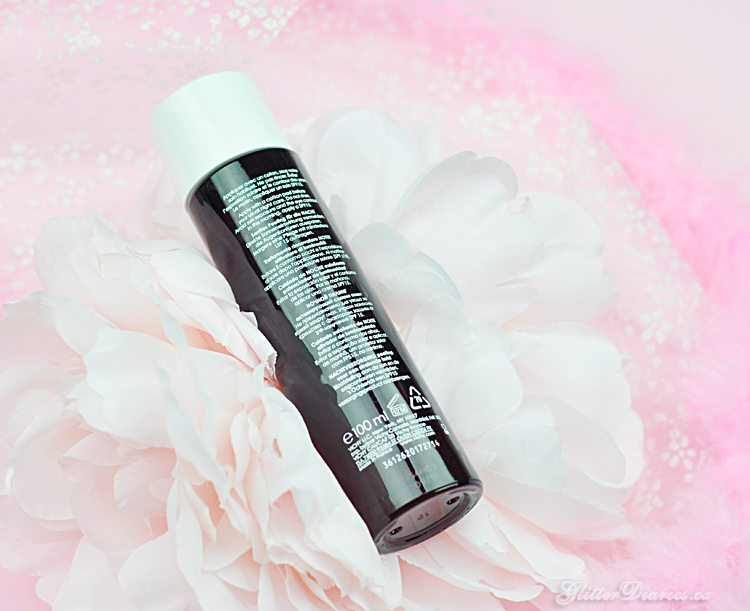 The Cleansing Mattifying Foam ($19.95 / 150 ml / Available at Mass Drugstores) is a very effective mattifying cleansing foam for cleansing away excess sebum and impurities without irritating and leaves the skin feeling soft and matte, not tight. The Skin Balance Anti-Oiliness Aquagel ($19.95 / 40 ml / Available at Mass Drugstores) is a lightweight moisturizer that offers the perfect balance of hydration and oil control in a cool, new aquagel texture. The formula gives your skin a purified and fresh sensation while mattifying and reducing the size of your pores. The Corrective Anti-Acne Treatment ($29.95 / 50 ml / Available at Mass Drugstores) has a formula that combines 1.5% Salicylic Acid, LHA, Phe Resorcinol and Air Licium Technology to treat and prevent signs of acne, blackheads, shine, visible pores, pimples and acne marks. It comes in a very light aerogel formula to give the skin a soft focus, mattified finish that lasts for 24 hours. As someone who has used body wash to cleanse his face, he noticed the difference almost immediately when he tried the foam and gel cleansers. His favourite of the two was the gel cleanser because he could really get it lathered up on his face and his skin felt great afterwards. He has a job where he spends a lot of time running around so the aquagel helps with making sure his skin doesn’t feel or get oily throughout the day. His favourite product out of the collection was the Corrective Anti-Acne Treatment because it has visibly reduced the redness from old acne, reduced his pores, and takes care of new flare ups. 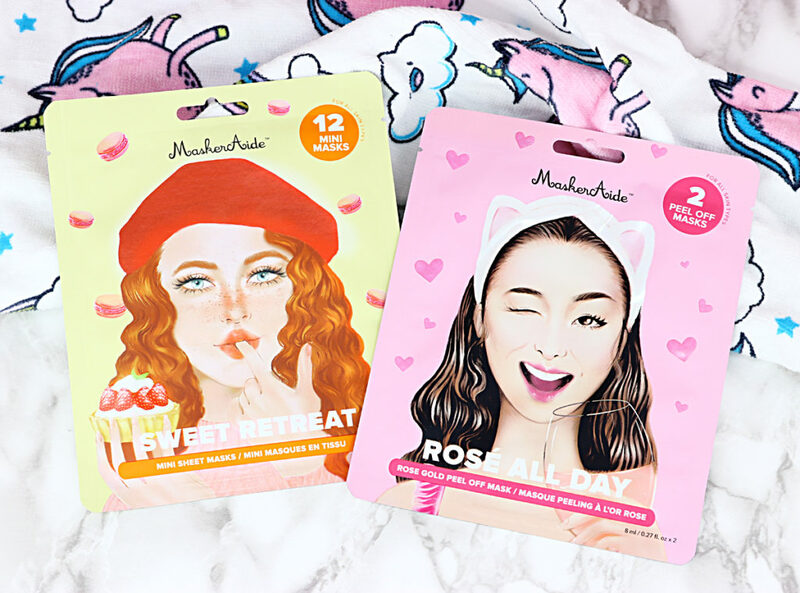 I can’t get him to totally change his ways when it comes to skincare but he has definitely found some new favourites that he will be heading to Shoppers Drug Mart for once he runs out! What do you think of my husband’s new & approved skincare routine? 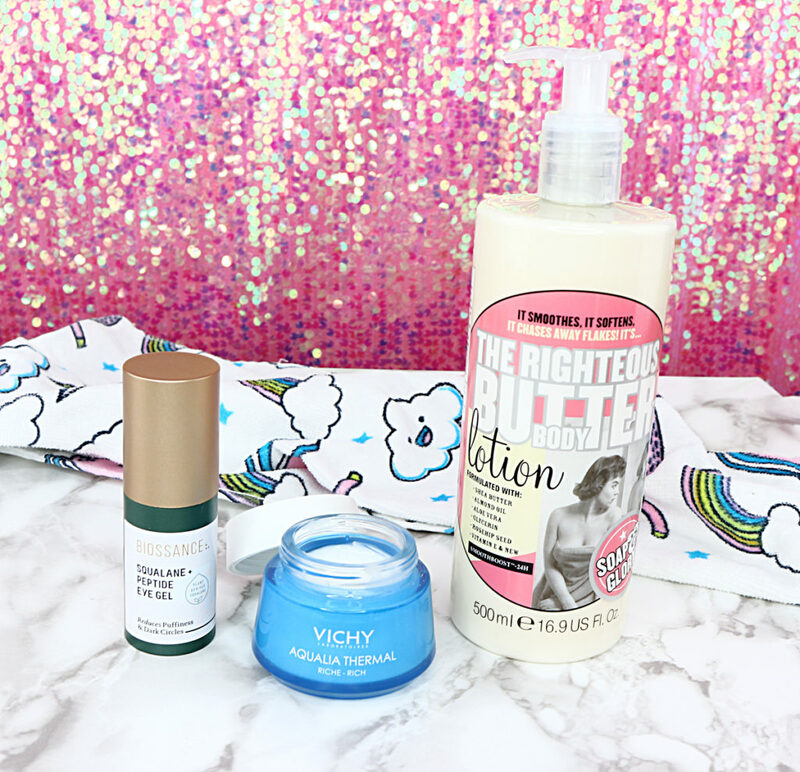 Have you tried anything from the Vichy Normaderm line?! Share your thoughts below! 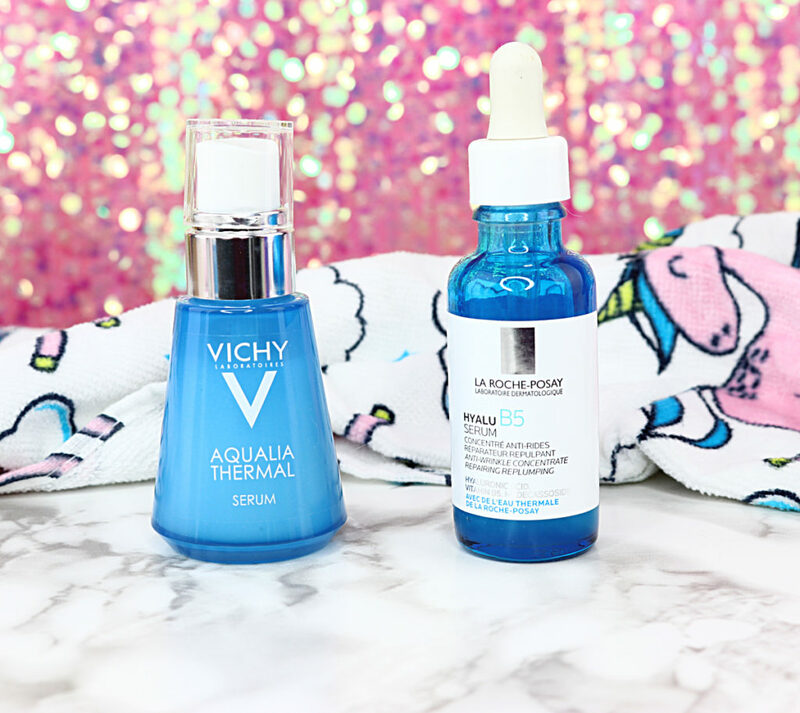 Vichy’s Idealia skincare line has long been a favourite of mine since I tried the Idealia Skin Sleep, Idealia Life Serum and the Idealia BB Creams, among others. This year they’ve added Idealia Peeling to their line which works overnight to remove dead skin cells and stimulate skin regeneration to give you a gorgeous glow and smoother skin when you wake up. 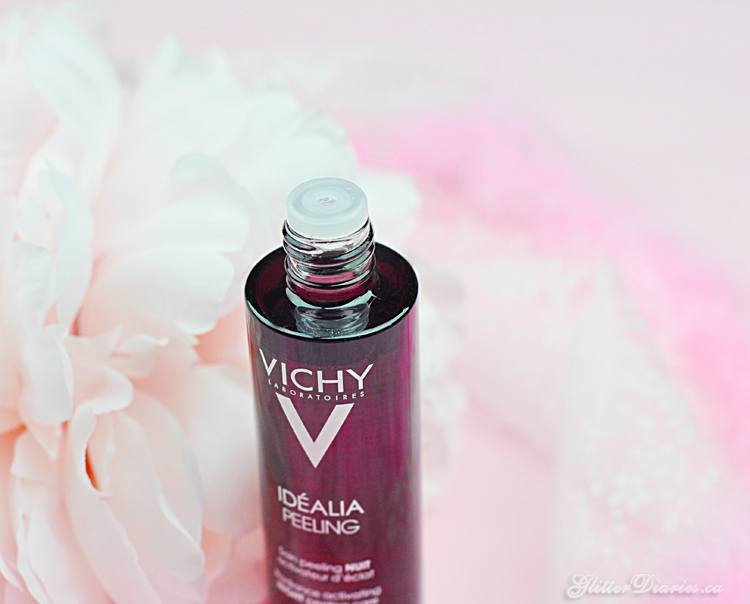 Vichy‘s Idealia line was pretty complete except for its night time offering, which is where Idealia Peeling Radiance Activating Night Peeling Care becomes a much needed and effective part of any skincare routine. 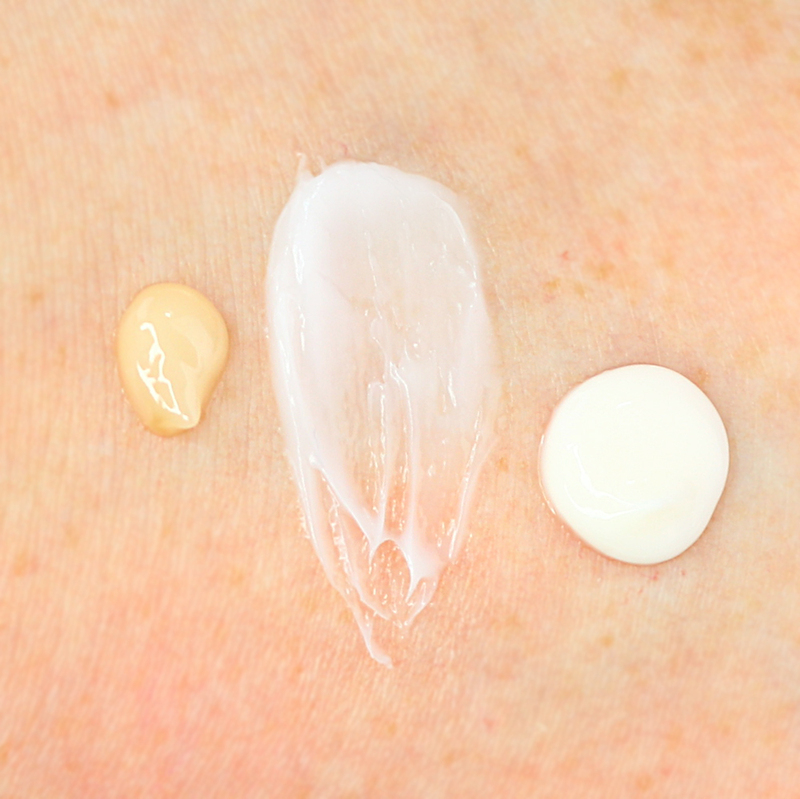 Over time, Peeling will even dark spots and fade acne marks, as well as smooth wrinkles. It contains peeling action due to glycolic acid (4%) and hepes (5%) combined with the extracts of fermented black tea and blueberry polyphenols, as well as Vichy Mineralizing Thermal Water. How to Apply: Apply on a clean face with a cotton pad (no rinsing needed) before you put on your serum and moisturizer. With Idealia Peeling being my first night time treatment that you just swipe on with a cotton pad, I was very excited to start using it. 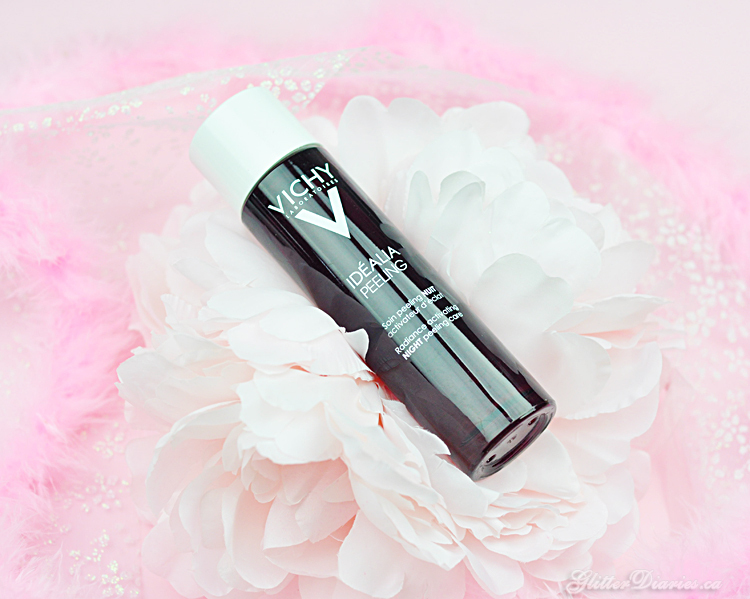 Like every other Vichy product I’ve tried, this one smells so amazingly refreshing and with a little dab of it onto a cotton pad, I can feel it tightening my skin a little and shrinking my pores and giving me an added glow before I go to bed. With 4% glycolic acid in it, it’s gentle but effective at keeping my skin looking smooth without drying it out. I currently use glycolic peels but I use them only once a week, so being able to use Peeling in between those sessions has made my skin look even better. Plus, I love how big the bottle is and the fact that it’s going to last me for a long time. If your skin doesn’t take well to glycolic peels or lotions that have a stronger glycolic acid percentage but you still want to be able to use something with it, I would definitely recommend this gentle formula! What do you think of the Vichy Idealia Peeling? Have you tried an exfoliating treatment like this one before?! Share your thoughts below!